Posted on March 16, 2016	by Rachel L.
Since 2016 began MasteryTCN has released 19 brand new titles, most of which feature HD video. Beyond new releases more than 75 courses have been updated to the latest courseware platform version. MasteryTCN courses play on all devices (smartphones, tablets, laptops, and desktops), and can be installed on any SCORM LMS. Utility Knife Safety This video educates users about the importance of safety standards and procedures for utility knives. Educated employees increase the safety of the workplace. I2P2: Injury and Illness Prevention Programs Use this course to prepare your organization to reduce the cost of workplace accidents and create a safe work environment with the I2P2 program. WHMIS and The Global Harmonizing System Employee Training Use this course to help employees understand the importance of the WHMIS, and how safety precautions help them prevent injuries and accidents when working with or around hazardous chemicals. Cut Protection This training helps workers in situations where cut protection gloves and clothing is needed. Prepare employees to make safe choices when it comes to cut prevention. 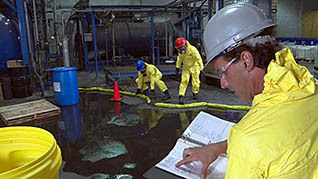 Hazard Communication: The GHS and You Use this course among your workplace to foster a greater understanding of the communication regarding hazardous chemicals in order to keep your employees safe. Walking and Working Surfaces in Construction Environments Provide your workers with an overview of important safety behaviors they should put into practice as they step on the construction site. Walking and Working Surfaces This training video teaches workers to be vigilant in protecting their safety by explaining the specific risks of walkways and floor, stairs and fixed ladders, portable ladders and scaffolding. Warehouse Safety Use this video-based program to inform or remind employees about basic warehouse safety measures they need to keep in mind while on the job. Fire Safety and Response: To The Point Use this course to demonstrate to employees the safety precautions to take to prevent fires and to respond should a fire occur. 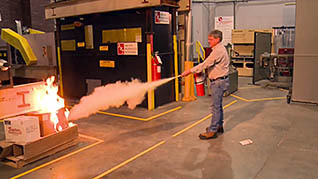 Proper Use of Fire Extinguishers: To The Point Employees that understand the dangers of fire and how to properly use fire extinguishers make the workplace safer for all everyone. Safe Forklift Operation: To The Point Utilize this course among your employees to ensure safe and effective forklift operation to prevent serious injury or death. Lockout/Tagout: To The Point Understanding the safety measures and roles in a lockout/tagout are important. This training provides the understanding of what to expect during a lockout. Personal Protective Equipment: To The Point Use this course to educate workers about the basic PPE they need to stay safe on the job. Preventing Slips, Trips and Falls: To The Point Some of the leading causes of workplace falls are from wet and slippery floors, improper footwear, and not paying attention. This online training course explains how to prevent slips, trips and falls in the workplace. Safety Awareness for New Employees Use this course to reduce the risk of typical on-the-job dangers like slips, trips, and falls, fires, and infection from bloodborne pathogens. 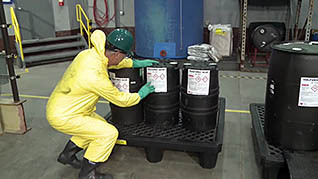 Hazard Communication Program: To The Point Utilize the information presented here and learn how to properly control the dangers hazardous chemicals present. Preventing Hearing Loss: To The Point This online training course teaches employees how to prevent hearing loss. Bloodborne Pathogens: To The Point This short, concise video is easy to understand and effectively makes the point that is impossible to discern contaminated blood and devices from those that do not carry bloodborne pathogens, and therefore, following solid risk management techniques is the best way to prevent contracting a bloodborne illness. Confined Space Entry: To The Point Help save lives by being aware of the hazards around you and by using safe work practices when entering a confined space. If you are looking for e-learning content and want more information on our courseware, click here.